I have been waiting in anticipation to cherry season. This Cardamon Cherry Ice Cream is smooth, silky, divine on its own but ever since I baked this Rolled Oats, Cardamon and Cherries Upside Down Cake back in July, 2011, I could not shake how brilliant the trifecta flavor combination was. I wanted to apply the same flavor profile to an ice cream this season. Question was how would I incorporate the oats into my ice cream without losing the purity of this frozen dessert. A couple of friends on twitter helped me brainstorm. One suggested I steep the oats in the ice cream base overnight. I was worried my base will be (will turn, would be, would turn) murky, dulled, lose the clean vibrancy of the ice cream base infused with Madagascar vanilla bean and cardamon. I also worried of the consistency being affected by the starch in the oats. Steeping the oats to draw the flavor into the base was ruled out. What's next? Meanwhile the pitted and halved cherries were macerating with four tablespoons of sugar overnight in the refrigerator. I always liked the idea of cookie dough in ice cream, though I am more enamored with the idea, then actually like it in reality. 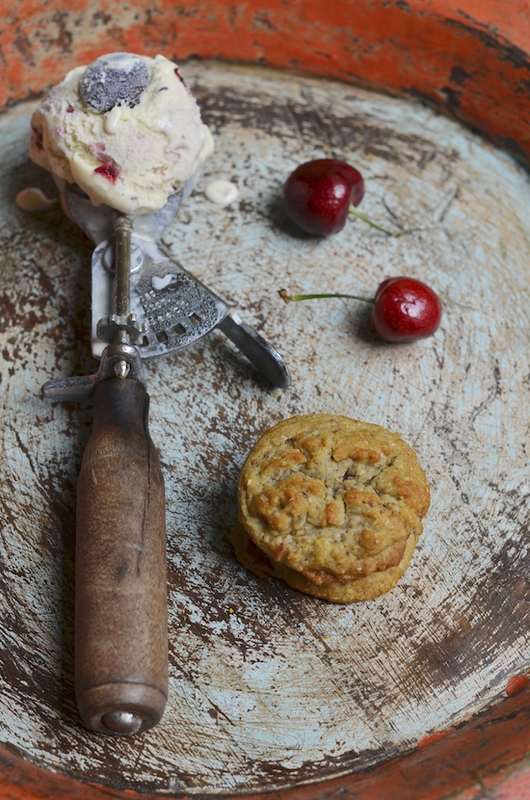 I thought it would be great to incorporate an oatmeal cookie dough into the ice cream to complete the flavor profile but wouldn't you know it, frozen cookie dough, is trickier than one might think. I didn't want to add a cookie dough that had egg, even pasteurized, into my ice cream. I knew even an eggless cookie dough has to be chewy when frozen, not turn rock solid. Lastly I didn't want the added calories directly in my ice cream so you see my lack of motivation to perfect a cookie dough appropriate for freezing. I was getting nowhere. I like a sturdy cookie recipe just like this Polenta Citrus Sable one. Sturdy as in tried and tested. Sturdy as in constructed so well that when I go and play with and tweak it to my tastes and needs it won't crumble (pun intended!). That's why I turned to Stella. Although many of her creations are nostalgic American childhood sweets and pastries, and I don't have a point of reference, I admire her meticulous experimentation and technique. She does not tire until she perfects the results. You might remember Stella was gracious enough to share her Pumpkin Seed and Matcha Macarons with Coconut, Dark Chocolate Ganache in the Nut Free Macaron Series, two years ago, back in June, 2011. Now she is writing a book to be published, I believe, in 2014. Yay, Stella. Please read Stella's recipe and directions as well. Her tips will enhance your cookie baking experience. I might add, that although I like the reduced level of sweetness in my cookies below, even if served on their own, without the ice cream, you might have more of a sweet tooth and rather use Stella's 7 oz (1cup) sugar recommendation. Preheat oven to 350F and line 3 cookie sheets with parchment paper. 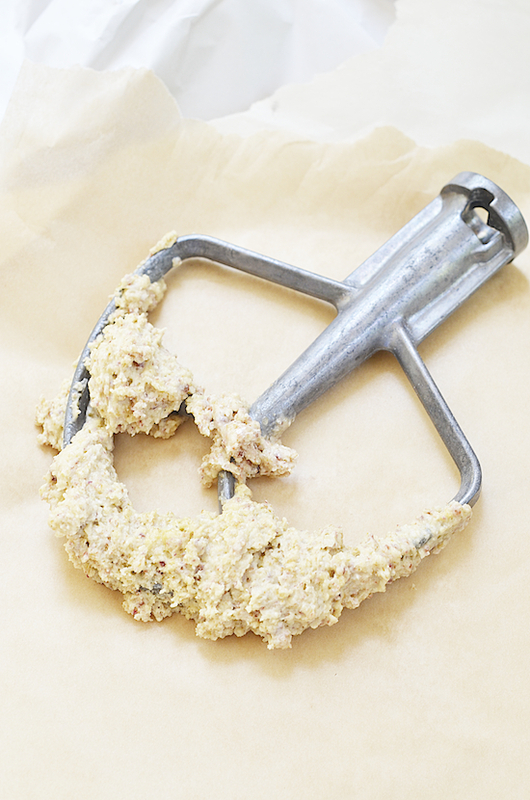 In a food processor combine the flour, oats and dried cherries. Process for about 2-4 minutes. You will see tiny speckles of the red cherries peeping through the flour oats mealy processed combination. In a mixer with a flat beater (guitar) attachment cream the butter, oil, sugar, honey, baking soda, baking powder, salt and cardamon on a medium speed for approximately 2 minutes. Scrape the sides, add the egg and continue creaming for 1 minute. 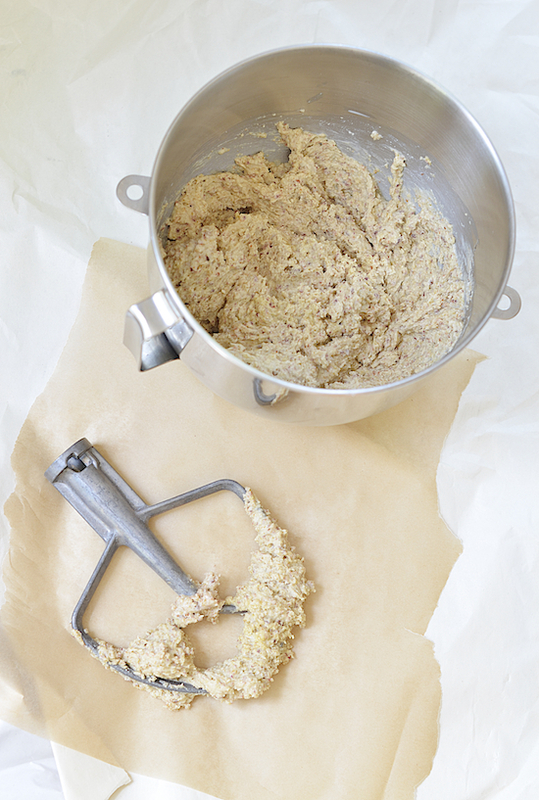 Reduce the speed to low and add the dry flour mix. Incorporate the dry and wet ingredients in the mixer for another minute, then add the milk and continue for 30 seconds longer. With a rubber spatula make sure all ingredients are incorporated evenly. 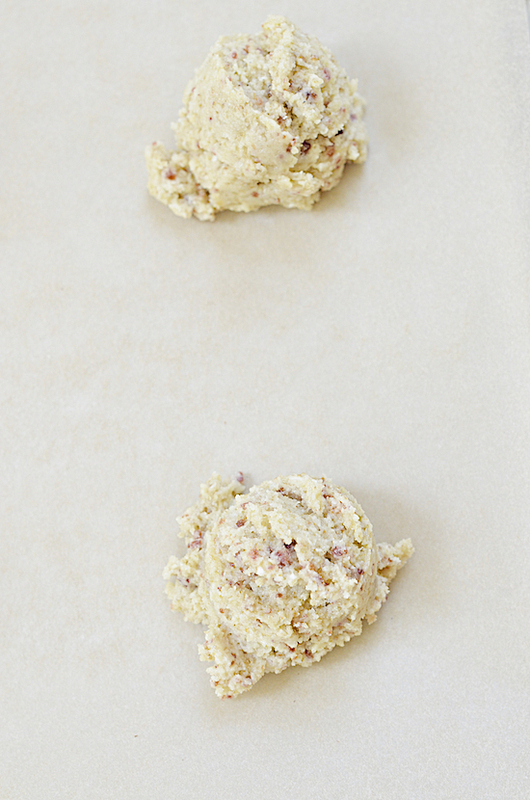 With a melon baller scoop the dough to fit 12 cookie dough balls on each cookie sheet. You can flatten the cookies with the back of a spatula if you wish to use them for ice cream sandwiches. Bake at 350F for approximately 9-10 minutes (ovens vary). Let completely cool before trying to remove the cookies from the cookie sheet. If you happen to touch the cookies as them come out of the oven and they are super soft, no worries, let them completely cool to. 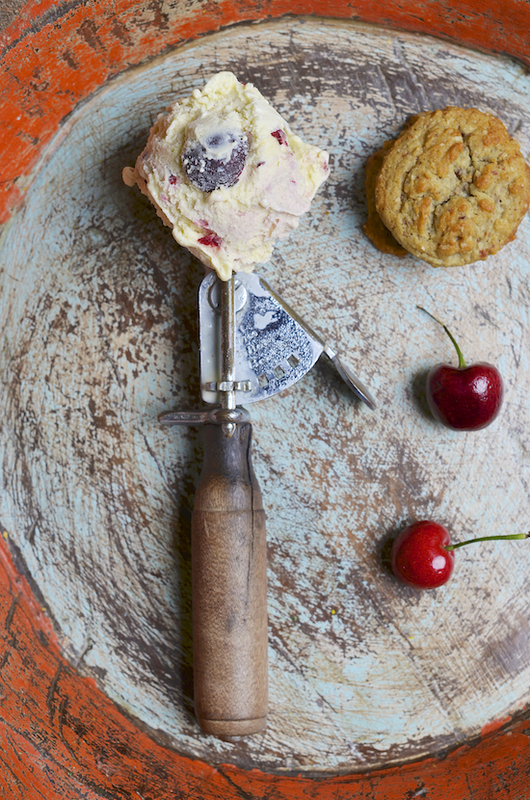 Serve on the side of the Cardamon Cherry Ice Cream, whole or crumbled into small size chunks. These cookies are super soft. In a non reactive medium sauce pan with a heavy bottom add the milk, sugar and cardamon. Split the vanilla bean and scrape the seeds from the inside. Add the scraped seeds and bean to the milk. Turn the heat to low medium heat and mix with a spatula once or twice to make sure the sugar is dissolved. Once bubbles start appearing around the edge of the pot. Add 1/2 cup of the warm milk into the egg yolks in 2-3 increments while constantly whisking the egg yolks. This process is called tempering. Add the tempered egg yolks into the sauce pan while constantly whisking for up to 10 minutes. The milk/yolk mixture will turn into a light thin custard. Remove from the heat and pour the custard base into a heat resistant bowl with a lid. Let completely cool and refrigerate overnight. Whip the whipping cream in a mixer on medium/high speed until stiff. Strain the custard base through a sieve into the whipping cream and mix well with a rubber spatula. Churn in an ice cream maker according to manufacturer's instructions. 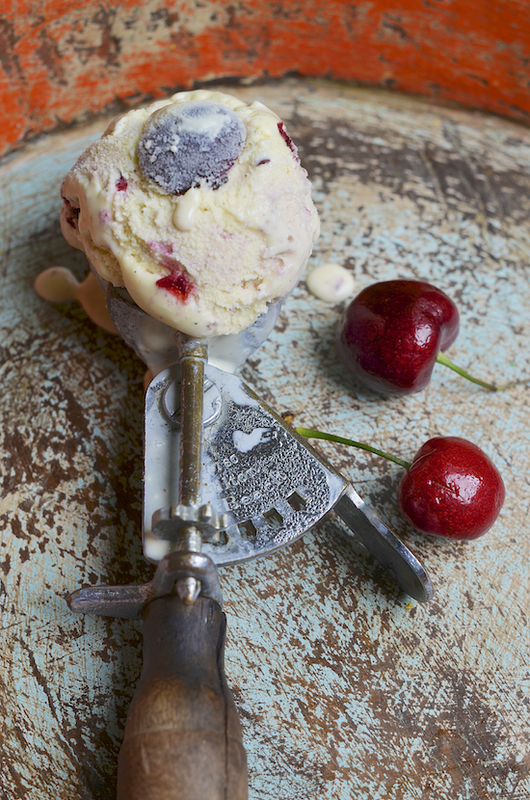 Once it reaches a soft serve consistency strain the cherries and add them to the ice cream maker. Churn for a few seconds longer until the cherries are evenly incorporated. Scoop into the pre-chilled containers. Cover with a lid and keep in the freezer, ideally overnight. If you do not own an ice cream maker look at the tips in this Salted Caramel Ice Cream post for an alternative ice cream making method. 2. Save the macerated cherry juice/liquid. It's delicious. Use it to moisten cakes or infusing custards. 3. More often then not I skip or forget to pre-chill the ice cream containers and lids in the freezer, but when I do remember, I get an unexplained enormous sense of satisfaction. I even chilled the rubber spatula I used to scoop the churned ice cream from the ice cream maker into the chilled containers. No guarantees I will be as good next time but it's a good tip regardless. Both the ice cream and cookies look/sound amazing. Those are fantastic flavors.